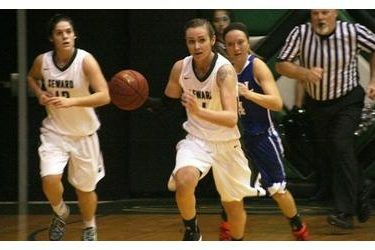 While it may not seem like much, the difference between a college athletes freshman and sophomore year is usually a big one and Friday night in the Greenhouse a pair of Seward County veterans showed just that as sophomores Brianna Scott and Kyndal Davis combined for 40 points as the Lady Saints cruised late past a tough Hill squad 66-51 to open their 2014 season 1-0. It didn’t take the Lady Saints long to get the scoring going as Rebekah Hatchard nailed a three on Seward’s first possession to give them an early 3-0 lead. After Hill took their first lead of the night at 7-5, Brianna Scott answered the bell for the Lady Saints, scoring eight straight points to put Seward back in front 13-7. The Lady Saints built onto their lead to 19-9 on a three from Brooklyn Artis before the first half media timeout and at the stoppage it was all Seward 25-9. Seward remained up big 30-15 with just over 5:00 to go in the half but a 10-0 run by the Lady Rebels had Lady Saint fans back on the edge of their seats as the Seward lead was down to just five with less than a minute to go before the break. A big three by Scott stopped the Hill run and Scott managed a steal and score before the buzzer to give the Lady Saints a 35-25 lead into the locker rooms at half. Scott led all scorers at the break with 18 points while the Lady Saints shot 39% from the field and held Hill to 33% shooting. The second half didn’t start nearly as well for the Lady Saints as Hill came out of the locker rooms on an 18-4 run after Seward scored on their first possession and just like that the Lady Saints lead was gone and Hill had their first lead since the early moments of the game at 43-41. A nice connection between Seward bigs Tamara Seda and Axelle Bernard tied the score and quickly the Lady Saints build a lead back up to eight after a pair of Kyndal Davis free throws. The Lady Rebels hung around and cut Seward’s lead down to just four with under 4:30 remaining, but the Lady Saints held Hill without a single point for the final 4:21 of the game, outscoring them 11-0 during that span to open up a 15 point lead to eventually win 66-51. Seward certainly didn’t burn the nets up in the win, hitting just 37% of their field goal attempts, but the Lady Saints held Hill to 35% shooting and outscored the Lady Rebs 14-3 at the free throw line to come away with the 15 point victory. Scott led the Lady Saints with 23 points and 4 assists in the victory while Davis turned in a double-double on opening night with 17 points and 11 rebounds. The Lady Saints will look to wrap up the weekend with a 2-0 record on Saturday night when they host Murray State to wrap up the Pepsi Classic at 6:00. The Lady Aggies will also be looking to remain perfect after a 16 point victory over Garden City to open up the classic.